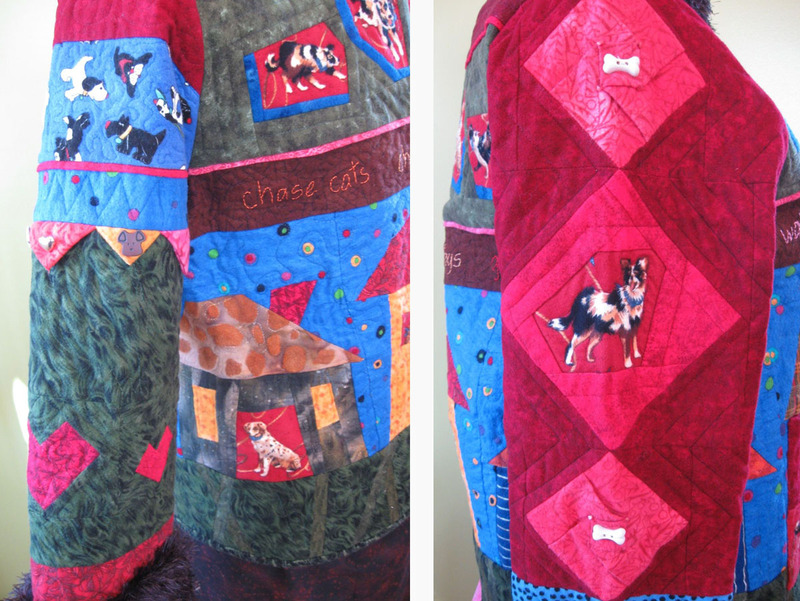 "Puppy Loves and Doggie Comforts"
One of the members of my quilt guild asked me about a quilted jacket I made in 2004. It must have made an impression if she remembered something from... (yikes!) 8 years ago. This piece, entitled Puppy Loves and Doggie Comforts, was created in response to a guild Challenge. From there it traveled to shows and exhibits and received an Honorable Mention at the Mid-Atlantic Quilt and Wearable Art Festival XVI in 2005, a 3rd place award at the Smoky Mt. Quilt Show/Dogwood Arts Festival, and was juried into Artwear Celebrated, an artwear exhibit and fashion show at the Studio Channel Islands Art Center in Camarillo, California. 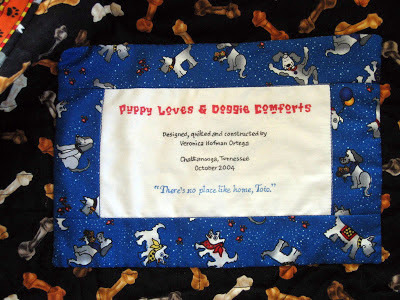 So, for all the animal lovers and those that appreciate light-hearted wearable art pieces, here is a revisit of Puppy Loves and Doggie Comforts. I hope it makes you smile! 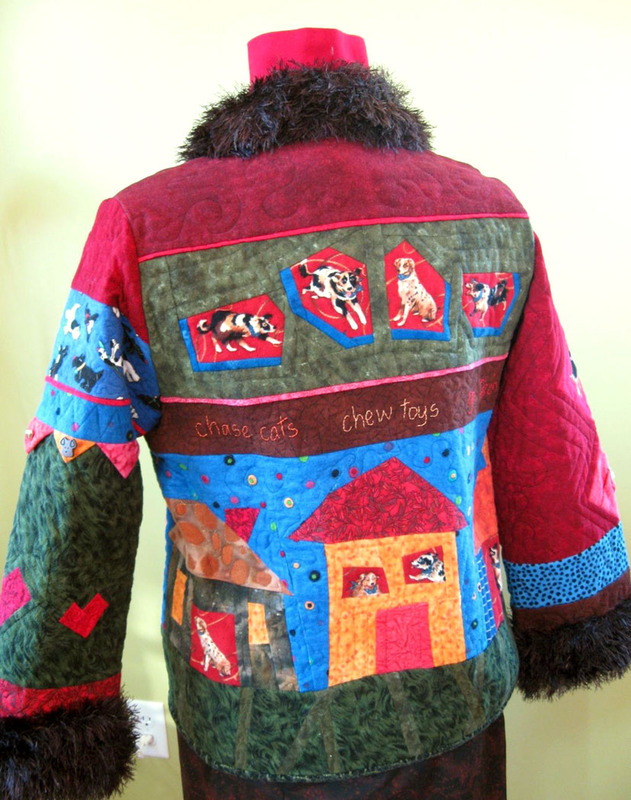 Wearable art jacket, front view. The jacket is pieced and quilted with cotton flannels, has a cotton lining and is trimmed with a hand-knit collar and cuffs in a novelty eyelash yarn. 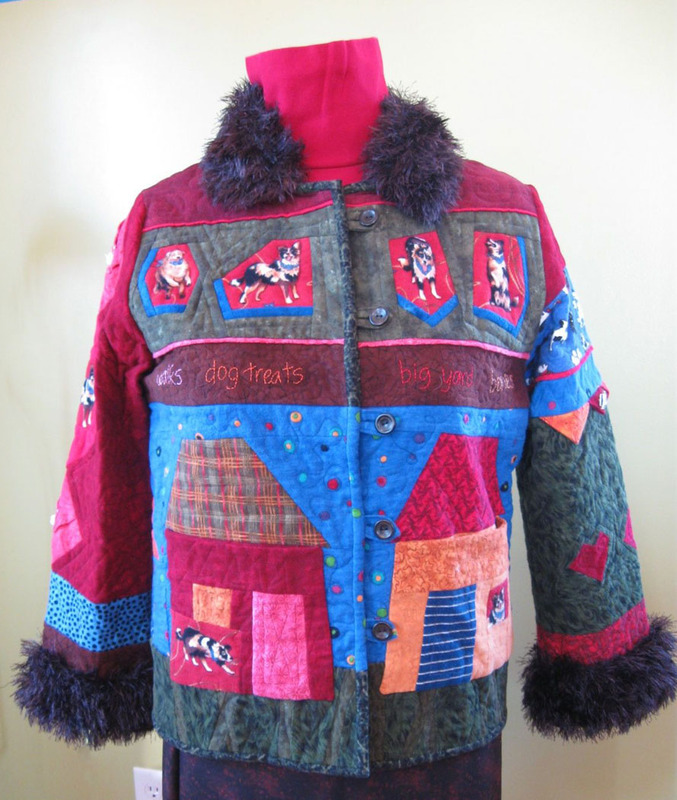 It is embellished with hand embroidery, dimensional folded fabrics (prairie points, fabric origami and flat piping) and buttons. It has looped buttonholes and front button closures. This was one of those guild Challenges where you blindly pick 3 crayons from a bag and you must use 2 or 3 of the colors somewhere in your piece. I recall that two of my colors were turquoise and dark brown. The third may have been the burgundy red (or the one that I dismissed). I think the turquoise was very successful in this piece—it offers a punch of color. 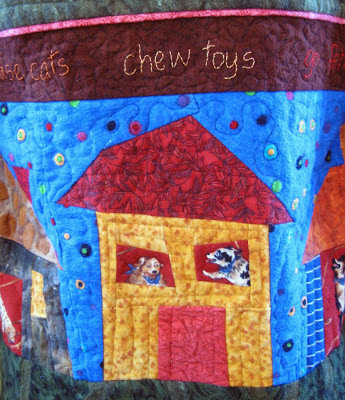 Back detail of "dog" houses. All the houses have dogs which can be seen in the windows, doorways or in front of the houses. 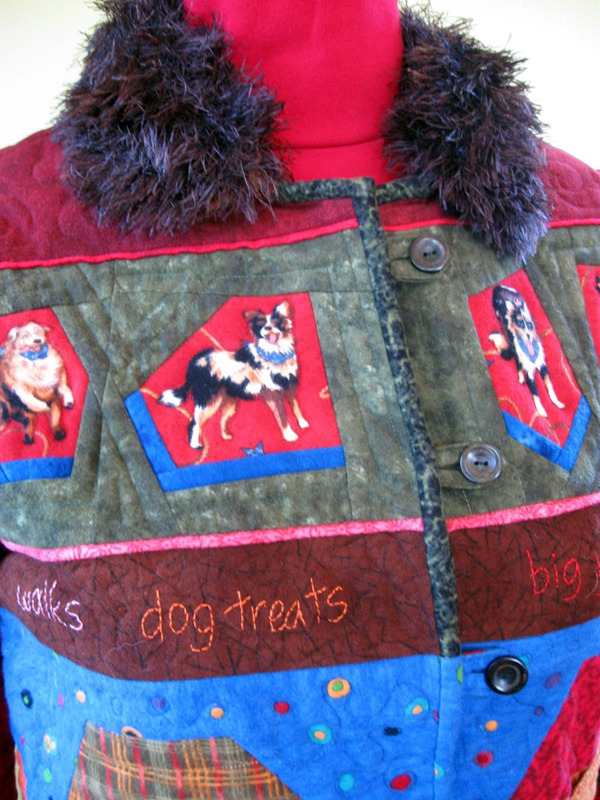 The idea behind this piece is that it was created from the perspective of a dog. The "puppy loves" and "doggie comforts" (things that dogs like, or like to do)—walks, big yard, chase cats, chew toys, dog treats—are embroidered around the mid section of the jacket. Other details include functioning front pockets, dog-themed cotton fabric for the lining, and bound edges. Left: front pocket. Right: lining of left lapel. 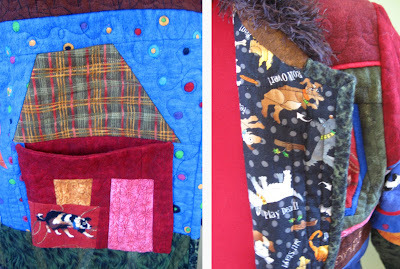 I pieced the flannel fabrics used on the bound edge so they would match the jacket fabric. It was a challenge to make sure the piecing aligned. The fabrics used for the button loops correspond with the color of the base fabric. I did not want a contrast between the loop and the jacket to be a distraction to the eye. Bound edge, looped buttonholes and hand knit collar. The left and right sleeves are different. Bone buttons are sewn to folded origami puffs on the right sleeve. Prairie points and more buttons adorn the left sleeve. 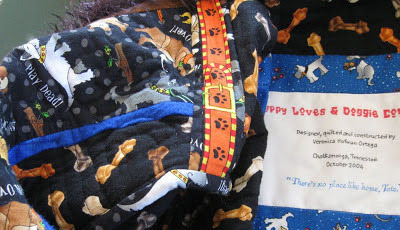 Three red hearts are pieced into the left sleeve—one for each of my dogs. The interior seam allowances are bound as well. Below shows the shoulder seam allowance bound with a novelty dog collar fabric. 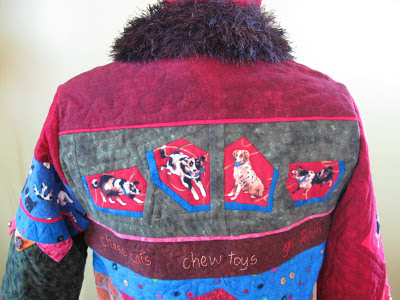 Another novelty fabric (black with dog bones) is used as a lining. Inside lining with bound seam allowances. The jacket was quilted in pieces (fronts, back, sleeves) and then assembled. The label is sewn inside the jacket on the back. 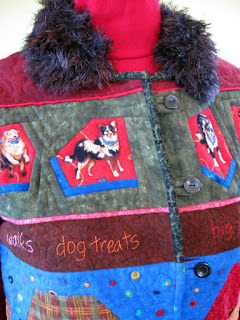 I hope you like my wearable art doggie jacket. It was fun to collect the fabrics and then share the finished piece. I hope seeing it makes you want to hug one of your furry friends. Wow, that is one amazing piece of art, Veronica! And I definitely understand why someone would remember it! Thanks for your kind words, Debra. The jacket means a lot to me, but I'm glad others enjoy seeing it, too.